Author and Boston University law professor Pnina Lahav discusses her forthcoming biography, “Golda Meir: Through the Gender Lens.” She explores the first and only woman prime minister of Israel, and her complex relationship with her role as a female leader in a man’s world. As a child, Golda migrated from Russia to Wisconsin and received conflicting messages about her place in the world. Wisconsin law insisted she had to be educated in school and wouldn’t allow her to work at her mother’s grocery store during the day. However, as a young woman, the message from society was also clear: women were supposed to become wives and mothers – and her parents were eager for her to comply. Her sister, Sheyna, encouraged Golda to run away from home in order to pursue the life she wanted. Sheyna gave her this advice: “The main thing is, never get excited – always become an act of cooling. This action will bring you good results.” Golda put this advice to use in the many political crises she encountered throughout her adult life. According to Lahav, Golda had a nuanced view of the division of labor between men and women. During the rise of the feminist movement, many women resented being resigned to the kitchen. However, Golda endorsed kitchen work as a way to contribute to the community. She felt that, in the fullness of time, gender roles would melt away, and she instead focused on the needs of the Jewish people as a whole, as opposed to the needs of women, specifically. 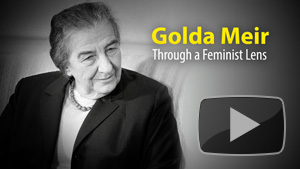 To learn more, watch Golda Meir Through a Feminist Lens. Browse related programs in the series Herman P. and Sophia Taubman Endowed Symposia in Jewish Studies.